"WASHINGTON, D.C. -- U.S. Secretary of Education Rod Paige this month will join leading members of Congress to address a national Hispanic higher education forum focusing on the college and career development needs of the nation’s youngest and largest ethnic population. Secretary Paige will speak at 3:30 p.m. Monday, March 31, at the Hispanic Association of Colleges and Universities (HACU) 2003 National Capitol Forum on Hispanic Higher Education. This year’s Capitol Forum, “Creating a New Framework for Our Future,” is scheduled March 30 – April 1 at the Washington Marriott Hotel in Washington, D.C.
Also scheduled to address the Capitol Forum are: the Honorable Robert Menendez, Chair of the House Democratic Caucus for the 108th Congress; the Honorable Ruben Hinojosa, Chair of the Education Task Force for the Congressional Hispanic Caucus; and, Leslie Sanchez, Executive Director, White House Initiative on Educational Excellence for Hispanic Americans. Presidents and chancellors of colleges and universities from throughout the United States also will join a roster of speakers that includes representatives of many of the nation’s best-known corporations, as well as leading representatives of NASA, the National Science Foundation and U.S. Departments of Agriculture, Defense, Education, Energy, Health and Human Services, Housing and Urban Development, and Interior. Hispanics, according to the latest reports by the U.S. Census Bureau, now make up the nation’s largest minority population, and represent one of every three new workers joining the U.S. labor force. Yet, Hispanics suffer disproportionately high poverty rates, and continue to suffer the lowest high school and college completion rates of any major population group. 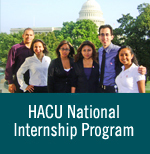 HACU will propose record new federal investments in the pre-collegiate and higher education needs of Hispanic students served by HACU’s membership of more than 340 colleges and universities located in 23 states and Puerto Rico. These higher education institutions serve the largest concentrations of Hispanic higher education students in the United States, and also are at the forefront of every major Hispanic community education initiative spanning kindergarten through lifelong learning needs. Yet, Hispanic-Serving Institutions receive only a fraction of federal funds per student on average compared to all other degree-granting institutions. HACU will outline a comprehensive, cost-effective blueprint for addressing Hispanic higher education needs with HACU’s Legislative Agenda for federal Fiscal Year (FY) 2004. HACU also will propose long-term increases in federal funding for Hispanic higher education as part of the reauthorization of the Higher Education Act. Reauthorization will determine federal spending policies for all higher education institutions for the next five years. “Every one of us has a stake in providing our Hispanic-Serving Institutions the support they must have to adequately prepare such a vital part of our future workforce, defense, entrepreneurial and leadership ranks,” Flores said. A key “grass roots” component to HACU’s Capitol Forums will be a day-long series of visits to Capitol Hill on April 1, during which leaders of HACU member colleges and universities will meet with key House and Senate members about Hispanic education and workforce training needs in every state. A closing reception on the evening of April 1 will formally honor the nation’s leading champions of Hispanic higher education access, equity and success. For more information, contact HACU’s national headquarters in San Antonio, Texas, at (210) 692-3805 or HACU’s Washington, D.C., offices at (202) 833-8361. Visit www.hacu.net for a complete Capitol Forum Agenda and comprehensive reports on HACU’s Mission, Membership and Legislative Priorities."